April 15 may have been Tax Day but the student athlete of the Rising Stars Youth Foundation had another kind of IRS mind, says Paul Savramis. Sunday, April 15, 2018, was a special day for the students of the Rising Stars Youth Foundation, says founder Paul Savramis. On this day, nearly three dozen student athletes offered their collective volunteer power to pack food for more than 500 hungry children. The students call these volunteer events In Real Service, or IRS. 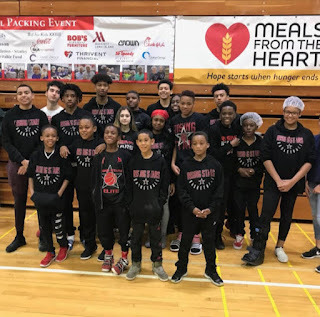 According to Paul Savramis, this was the eighth consecutive year that Long Island Lutheran High School sponsored the meal packing event, which had children filling more than 300,000 food packets to be shipped globally and distributed to children here at home. 306,922 meals were packaged and sent to the Andrew Grene School in Haiti and various food pantries in and around Long Island. Long Island Lutheran has, to date, raised more than $72,000 to help battle food insecurity. Paul Savramis explains that in addition to money, goods and services have been provided by Liberty Coca-Cola, numerous church and community organizations, and several private donors from the area. As a community event, Paul Savramis explains that the act of packing food not only increases awareness of hunger as a global problem, but also brings students together to serve a greater good. Learning experience gained through volunteerism helps children grow into responsible global citizens, asserts Paul Savramis. The Rising Stars Youth Foundation is known primarily as a basketball program but athletics is secondary to academic and social responsibility. Students on any of the organization’s teams are required to complete a set number of community service hours each month and maintain their grades and behavior at school and home. For more information on upcoming meal packing events at LuHi, visit LongIslandLutheran.org.